While there are costs involved in the installation, cleaning and maintenance of rain gutter systems, they help prevent costly home repairs down the road. In fact, faulty rain gutters are the single biggest mechanical contributor to the deterioration of your home. Many gutters are either poorly designed, are not correctly installed, or are very poorly maintained, to the point that have become damaged or have started to deteriorate. Basement flooding. Rain gutters divert water away from from the foundation of your home, preventing flooding. Without properly functioning rain gutters, water collects at the foundation of your home, which can cause water to seep in and flood the basement. Foundation problems. As water from the roof pools onto the foundation below, this can erode the ground, creating cracks in the very foundation of your home. This can be incredibly expensive — repairs can easily be reach tens of thousands. Mold and mildew. If a gutter is clogged, the rainwater backs up, spilling over the back of the gutter, saturating the eaves and soffit. This dampness can lead to mold and mildew, which causes wood to decay. Water can also leak into the house, causing mold and mildew that can endanger the health of your family. Insects. Improperly functioning gutters can cause still water to collect around your home, attracting mosquitoes. Gutters that are not functioning properly can also cause bare wood to become saturated with water, causing dry rot, creating an environment for a potential insect infestation. Paint damage. A properly installed gutter system directs water away from painted or stained surfaces, maintaining the value of your home by keeping it looking newer. 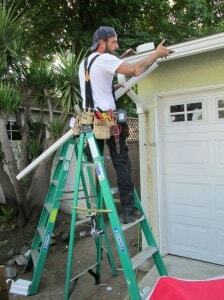 Gutter maintenance and repairs are often procrastinated chores, as they can be difficult and time consuming. They also require climbing up to high places, putting you at risk of an injury. If you value your home, however, it’s your responsibility to see that it is properly protected. Whether you choose a professional for peace of mind or have the means to tackle the project on your own, the short term costs are far lower than the resulting necessary repairs due to neglect.